How to Clean Laptop Keyboard – A computer keyboard collects daily a lot of dirt and is usually little cleaned. In fact, it can be a fertile ground for the proliferation of various bacteria. Not sure how to dust it in depth? Here are some tips. If it is an external keyboard, you better disconnect it. Disconnect the USB cable connecting it to the base of your computer (if it is an old computer, you will be sure to turn it off completely before disconnecting the keypad). Return your keyboard preferably over a towel or surface that is easily cleaned. Use a canister of compressed air to blow the dust between the keys. Tap it repeatedly so that the dirt is extracted. Repeat the process so as to remove a maximum of dirt. Small items do not want to take off? No problem. Go with a cotton swab soaked in alcohol along the sides that you do not judge clean. Do you really want to clean your keyboard in depth? Gently remove the keys using a screwdriver and remove the dirt using an aerosol spray. Use a slightly damp cloth to clean the whole thing. Make sure it is not too humid to damage your equipment due to water.Tip: Take a picture of your keyboard to remind you of the position of different keys. Tip: Take a picture of your keyboard to remind you of the position of different keys. After décrasséesing them one by one, you can put them in the right order (based on your photo). Turn off your computer and unplug your keyboard. Turn it upside down so that the moisture does not damage the wiring. Dry it with a rag while keeping it upside down. Try as long as possible to keep it in the inverted position and let it rest as it is for a whole night. An additional tip is to place it in an airtight box containing rice. No, you should not cook it but just fill a container with raw grains. Place the keyboard and sprinkle it with rice. What for? This will absorb the spilled liquid as well as the moisture. Make sure that there are no grains stuck between the keys, this will only aggravate the problem. Turn it upside down and unscrew all screws. Separate the upper part (with the keys) from the bottom. Pull both sides gently. There may be one or the other hidden screw. Make sure there are no elements that are still glued or screwed. Now you have the upper part of your keyboard in your hands. Turn it so that you have the bottom of the keys up and press each one. Attention to the space bar which is sometimes better fixed and more difficult to detach. If you can’t get it off, leave it as it is.Tip: Take a picture of your keyboard to remind you of the position of different keys. Take a container and fill it with water and detergent. Do not use a product that is too aggressive, choose a lighter variant.Tip: You can also place the keys in a special bag and put them in the washing machine. Tip: You can also place the keys in a special bag and put them in the washing machine. Store the keys in a container and rinse them. Pass them for example under cold water, the pressure will remove the remnants of dust not yet gone. Let the keys dry on a paper towel or use a hairdryer to move faster. Then place the top of the keyboard in a bucket of foaming product. If this does not fit, opt for a larger container or a cloth soaked in hot water. It’s a little less efficient but still, does the trick. Advice: You can use a duster or vacuum cleaner (in ‘ low intensity ‘ mode) to remove the crumbs from the keyboard. Is everything is perfectly dry? You can reassemble the different parts. Take care not to use water to clean the bottom of your keyboard. Press the two halves well, especially in the middle. If they are not fixed correctly, some keys will not work (or less well). Test your keyboard by connecting it to your computer and check to see if all the keys are working properly. 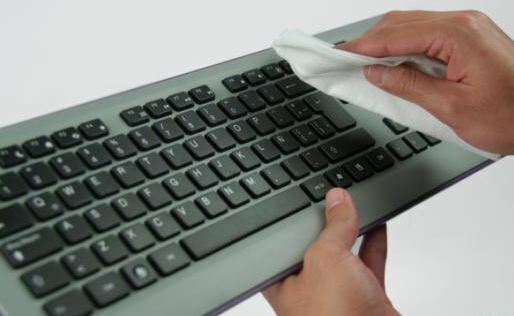 The keyboard of the laptop is integrated into a device, so its cleaning takes place in a different way. A cotton swab and a canister of compressed air should do the trick. You will avoid removing the keys. In any case, you will not be able to do this directly, especially for the space bar and the ENTER key. Leave them well in their place without damaging anything. If you absolutely want to remove them, ask a professional for help or bring your computer to a maintenance and repair computer store.